The Switch eShop has updated the listing for Diablo III: Eternal Collection, revealing some details we’ve not known before. First, the most important of all, is a November 2, 2018 release date for Diablo III: Eternal Collection. 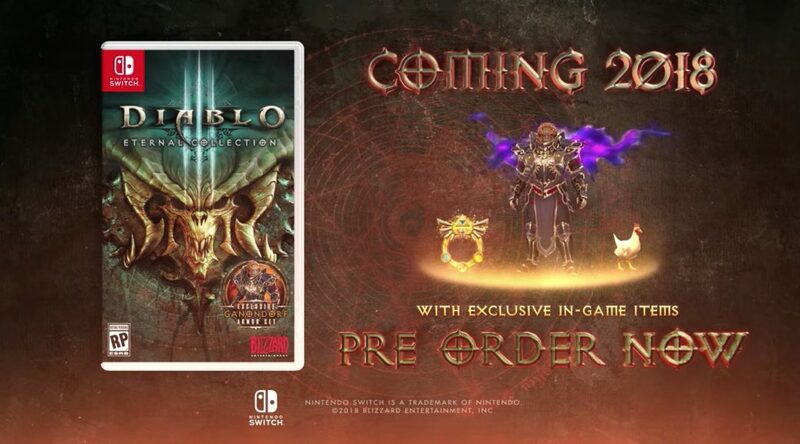 Neither Blizzard nor Nintendo of America have announced a release date for Diablo III: Eternal Collection yet, but we believe the date is accurate and will be formally announced during today’s Nintendo Direct. Next up are the minor but important details. Diablo III: Eternal Collection will be playable in Japanese, English, Spanish, French, German, Italian, and Russian. We’d like to point out Japanese as the game hasn’t been announced for the Japanese market up till now. Diablo III will take up 13.3GB of space and support up to 4 players both online and via local wireless. As expected, the Switch Pro Controller will be supported. Update (8:34am) – Confirmed by NOA.